Swapan Koley used to get up at 4am in the morning to collect his share of newspapers which he distributed to various households. This was his source of earning to continue his studies in the college. He also had a dream. A dream of changing the world where all students like him will be guaranteed the benefit of education, where man will not oppress man for higher and higher profits. It is this dream that the murderers of Trinamool Chhatra Parishad (TMCP) wanted to destroy when they brutally killed Swapan Koley on 16th December. He was beaten with rods and swords in his college. When he took shelter on the roof of a house near his college, he was thrown down from this roof. When he was trying to reach hospital on a rickshaw with the help of his friends, he was attacked again by the TMCP goons. Swapan Koley could not take it any more and died. His only crime was that he was an activist of SFI. Shouvik Hazra is a bright student of English Honours at Asutosh College, Kolkata. Like any other day he went to college on 16th December. On that day, the SFI along with the non-teaching and teaching staff of the college were participating in a procession protesting against the violence unleashed by TMCP. The procession was attacked by the TMCP goons and Shouvik Hazra lost his left eye when a stone hit his eye. This scale of violence unleashed in educational institutions is being orchestrated by the TMCP under the direct instigation of Ms. Mamata Banerjee and her cohorts to terrorize the youth and students who fight for a left cause and dream about making a better society. This is however not something very surprising. Ultimately the modus operandi of the Trinamool since its inception has been a politics of provocation and violence with which they have mobilized a large section of the anti-socials under their banner. It is this politics that has killed Swapan Koley and has blinded Shouvik Hazra. Skirmishes and stray incidents of violence has been a part of student politics all over India. It is also a common sight that the students who were fighting yesterday joke about the incident the next day over a cup of tea or coffee. What Mamata Banerjee has done through her brand of politics is to shred away the romanticism of student politics, the passionate appeal for one's ideology and politics, the liberal space of debates and discussions in college campuses. Instead with her brand of politics student politics has been hijacked by local goons and thugs, campuses are being turned into graveyards of students, politics is being turned into an arena where students will not dare to tread. In other words, Ms. Banerjee and her goons want to destroy the culture of politics within students. This is not mere speculation. The President of TMCP said that they believe that there should be no politics in campuses, in a program in the Bengali News Channel Star Ananda. 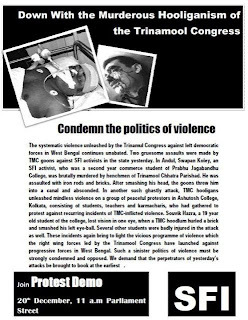 This is the real agenda of the violent attacks on the student community in West Bengal. It is the compulsion of Ms Banerjee to pursue this agenda since devoid of any constructive politics she is the first person to know that thinking students can never be part of the TMCP. This agenda is being driven with full speed keeping in mind the forthcoming Assembly Elections in West Bengal. The criminal activities of the TMCP in the college campuses is nothing but an echo of the larger murderous game plan of the Trinamool. 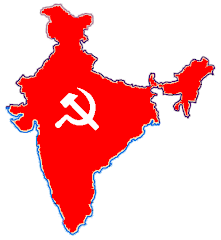 Their leaders openly proclaim that if they win the Assembly Elections in West Bengal, they will drive out all the left supporters and will uproot the children of Lenin! It is their vision that in West Bengal they will not allow the red flag to fly with brute force. In their pronouncements we are clearly hearing the footsteps of fascistic politics. What she and her followers have forgotten is a simple truth that dreams cannot be murdered, ideas cannot be suppressed and the left ideology cannot be physically exterminated. Swapan Koley's cold blooded murder is an assault on the idea of free speech, of the right to dream and think differently. With his murder however many more Swapan Koley will be born ready to carry forward the red flag and the ideology of Independence, Democracy and Socialism. While the people of West Bengal were trying to grapple with the death of a student, news came from Purulia that 7 Forward Bloc workers have been brutally murdered by the Maoists. This is the first time that such a big number of killings of political activists has taken place in West Bengal. Moreover, most of the activists were tribals, whom the Maoists claim to fight for. Gopeshwar Mahato, aged 70 was not spared by the Maoists. The Maoists also did not spare Ms. Chopola Gorait, a wife of a rickshaw puller and head of a panchayat. All these people were poor and supported the Left Front in West Bengal because of which they were brutally killed by the Maoists. The so-called revolution that the Maoists want to bring in India is basically a charade. What they are doing in West Bengal today is acting as mercenaries of the Trinamool. That is why Ms. Banerjee till date has not condemned any murder that the Maoists have committed in West Bengal. The current situation prevalent in West Bengal is one of intense attack against the CPI(M) and the Left Front, which is reminiscent of the semi-fascist terror of the 1970s. In this situation the party must ensure that all sections of the population are mobilized against the fascistic tactics of the Trinamool-Maoist combine. Already in the jungle-mahal area we have witnessed how thousands of people mobilized themselves and ensured that Maoists are sent on the back-foot. The heroic struggle of the people of jungle-mahal should inspire people across West Bengal to rise up in unison against the violence unleashed by the goons of Ms. Banerjee.